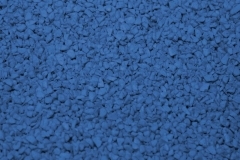 Used extensively in Australia for wet pour rubber surface applications, Safety Surfaces' Cova Rubba is available in both CSBR and EPDM and can be laid directly over existing concrete or pavers, even if slightly damaged. It is great for pathways, patios and verandahs. Cova Rubber is strong enough to support outdoor furniture, buggies and wheelchairs. Cova Rubba CSBR is manufactured using 1-2mm granules as standard and it comes in 9 different standard colours and available to suit your requirements. Cova Rubba CSBR is manufactured in up to 9 tonne batches so jobs up to approximately 900m² can be installed from the one batch. Cova Rubba OPAL EPDM comes in 0.5-1.5mm granules and it comes in 5 standard colours and 4 UV Bright colours. The Cova Rubba system is specified for use with Hardcure binder. Hardcure has been specially formulated to give the firmer properties which are required for use with outdoor furniture, wheelchairs, mobility scooters, walkers, golf buggies and the cure times are set for the best range of atmospheric conditions during installation.